What will I be doing when I’m there? Lucky me…I’ll be holding that precious sweetheart and singing lullabies. What will I be bringing with me? Picture books, of course!!! As well as a container of baklava for my daughter-in-law who LOVES it. Today is Perfect Picture Book Friday over at children’s author Susanna Hill’s blog. Check out all of the picture book reviews…there are over 1000 on her site!!!! This book will be one of the first in my grand-daughter’s library…in board book edition, of course. 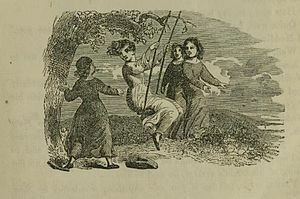 I love the classic picture books! Caldecott Honor Award – a true classic that has endured over 70 years! It’s like taking a trip to Paris…Mr. Bemelmans was an amazing artist and he captured many street scenes in the illustrations! One of the best read aloud books ever written! Look at a globe and find Paris, France! Find the famous landmarks that appear in the book…the Eiffel Tower, Paris Zoo, etc. Lovely story to read if a child is scheduled to go into the hospital and is anxious about it. This is so simple and so much fun! Cut construction paper to fit inside to ‘wallpaper’ the inside walls and glue in place. Use a very small box for the bed and cover with paper or material. You and your child can make it more complex by stacking several boxes to build a dollhouse. When little Sophie gets bigger perhaps she and her daddy will make this together. This entry was posted in parenting, Perfect Picture Book Friday, Picture Book Review and tagged board books for babies, hospital anxiety, Ludwig Bemelmans, Madeline, read aloud books by viviankirkfield. Bookmark the permalink. Congratulations, Grandma Vivian! Sophie Eva will be all cuddles and oh so lucky to have such a wonderful grandmother! Enjoy you time together. Thanks, Marylin…I am having such a wnderful time…it will be hard to come home on Saturday! Congratulations again! 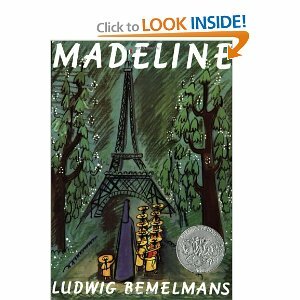 We love the Madeline books, great choice to put in a child’s bookcase. I also just reserved Madeliene at my library. I must go pick it up! I too love holding babies, my love and blessings to her. Congrats again on your grandchild! This is one of my all time favorites. I believe it is Bemelmans’ birthday today! Anyway, have a great visit with your family! Thank you so much, Belinda! What a lovely comment. :) I just visited your post…love your blog! Mazel Tov Vivian! What a lucky little girl Sophie is to have such wonderful parents and grandparents, and Madeline is a fantastic way to start a library! Blessings. Congrats on the new granddaughter! My sister Madeline is named after the Madeline books because my other sister Naomi asked my parents to name her that! Love the stories. Yay! Have FUN, Vivian. Madeline is a great picture book, a true classic. Baklava is a terrific dessert . . . also classic! Jake…I am so happy to see you here…I’ve missed your Sunday posts…I hope all is okay 🙂 Thanks for the comment about the new theme…you are the first one to say anything about it. 🙂 My blog needed major revisions and cleanups…and I have not had time to add back the blog buttons and other stuff..I’ll be adding it to the bottom sidebar and to a separate page I think. Wonderful post, and congratulations and every happiness with your new little granddaughter! 🙂 Of course Madeline is one of my all time favorite favorites, so I am always glad to see it 🙂 LOVE the shoebox dollhouse! I appreciate the lovely comment and good wishes, Susanna! 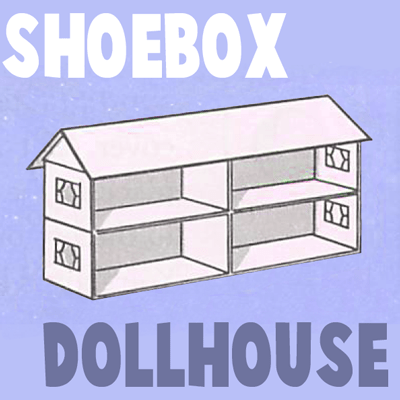 Isn’t that multi-level shoebox dollhouse cool? CONGRATULATIONS! A precious gift is given in the form of baby Sophie Eva.